Yield Curve is the graphical description of the relationship between yields on bonds of same credit quality but with different maturities. The typical yield curve is upward sloping, meaning short term to maturity notes have low interest rates and longer term to maturity notes have higher interest rates. Of course, one strategy to maximize investment return would be to invest in the longer term, higher yielding notes. The yields offered on Treasury securities represent the base interest rate or minimum interest rate that investors demand if they purchase a non-Treasury security. For this reason market participants continuously monitor the yields on Treasury securities, particularly the yields of the on-the-run(Recent) issues. A normal yield curve is yield curve in which short-term debt instruments have a lower yield than long-term debt instruments of the same credit quality. This gives the yield curve an upward slope. During such conditions, investors expect higher yields for fixed income instruments with long-term maturities that occur farther into the future. In other words, the market expects long-term fixed income securities to offer higher yields than short-term fixed income securities. This is a normal expectation of the market because short-term instruments generally hold less risk than long-term instruments; the farther into the future the bond’s maturity, the more time and, therefore, uncertainty the bondholder faces before being paid back the principal. In other words, the difference in yields between a 1 year and 2 year bond will usually be greater than the difference in yield between a 10 year and a 11 year bond. A flat yield curve, where yields for bonds with short term and long term maturities are very similar, is seen when the market is uncertain about which way the economy will go. When investors are not sure whether interest rates will move up or go down, the yields for bonds with different terms tend to converge. In the rare instances wherein long-term interest rates decline, a flat curve can sometimes lead to an inverted curve. Also a flat curve indicates slowdown of economy. This usually happens when central banks try to contain inflation by increasing interest rates, thus increasing short term yields. However, with the actions taken, the expectations of high inflation begin to subside to moderate inflation and expectations of higher long term rates also fall. The inverted yield curve, where yields for bonds with short term maturities are higer than those of long term bonds, is seen in very rare situations. Such a yield curve indicates that the market believes interest rates will soon go down. An inverted yield curve is a downward sloping curve. This type of yield curve is the rarest of the four main curve types and is considered to be a predictor of economic recession. Lower interest rates would lower the inflation expectations. Hence, here short term yields are higher than the longer term yields. Though short term yields are greater, few investors may still seek long term bonds as they expect a further economic slowdown where interest rates will further decline resulting in still lower yields. A type of yield curve that results when the interest rates on medium-term fixed income securities are higher than the rates of both long and short-term instruments. Humped yield curves are also known as bell-shaped curves. When the yield curve flattens, it means that the gap between the yields on short-term bonds and long-term bonds decreases, making the curve appear less steep. The narrowing of the gap indicates that yields on long-term bonds are falling faster than yields on short-term Treasury bonds or, occasionally, that short-term bond yields are rising even as longer-term yields are falling. A flattening yield curve can indicate that expectations for future inflation are falling. A flattening also can occur in anticipation of slower economic growth. And sometimes, the curve flattens when short-term rates rise on the expectation that the Federal Reserve will raise interest rates. When the yield curve steepens, the gap between the yields on short-term bonds and long-term bonds widens, making the curve appear less steep. The narrowing of this gap indicates that yields on long-term bonds are falling faster than yields on short-term bonds or, occasionally, that short-term bond yields are rising even as longer-term yields are falling. Steepening yield curve typically indicates investor expectations for rising inflation and stronger economic growth. The relative change in the yield for each bond maturity is called the shift in yield curve. 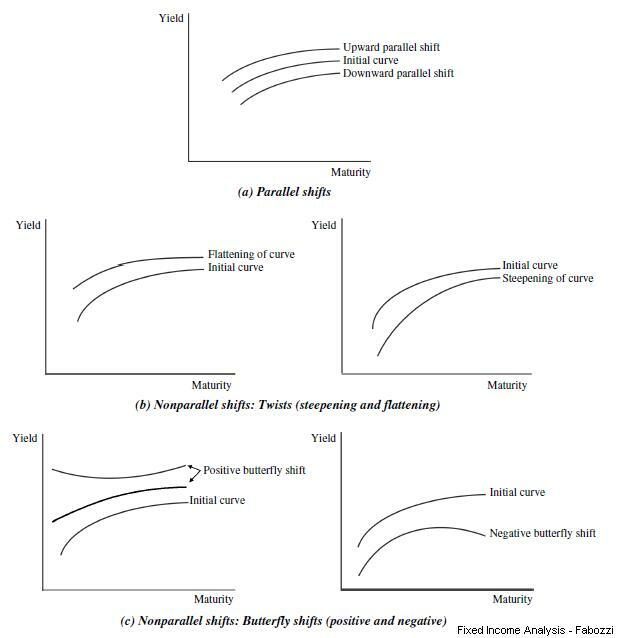 If the change in yield of all maturities is same, it is a parallel shift, while non equal changes in yield of all maturities bring about a non parallel shift in the yield curve. When there is a change in the shape of the yield curve, it implies that one needs to change his outlook on the economy. refers to a flattening or steepening of the yield curve. This type of shift involves the movement of yields at the short maturity and long maturity sectors of the yield curve relative to the movement of yields in the intermediate maturity sector of the yield curve. Such nonparallel shifts in the yield curve that change its curvature are referred to as butterfly shifts. The name comes from viewing the three maturity sectors (short, intermediate, and long) as three parts of a butterfly. Specifically, the intermediate maturity sector is viewed as the body of the butterfly and the short maturity and long maturity sectors are viewed as the wings of the butterfly. A positive butterfly means that the yield curve becomes less humped (i.e., has less curvature). This means that if yields increase, for example, the yields in the short maturity and long maturity sectors increase more than the yields in the intermediate maturity sector. If yields decrease, the yields in the short and long maturity sectors decrease less than the intermediate maturity sector. A negative butterfly means the yield curve becomes more humped (i.e., has more curvature). So, if yields increase, for example, yields in the intermediate maturity sector will increase more than yields in the short maturity and long maturity sectors. If, instead, yields decrease, a negative butterfly occurs when yields in the intermediate maturity sector decrease less than the short maturity and long maturity sectors. When we discuss yield curve changes from a bearish or bullish standpoint, we are describing if interest rate are rising(bearish) or falling(bullish). 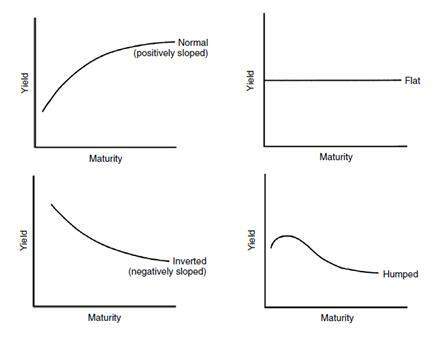 Now that we are done with Bearish, Bullish Yield curves and curve shape (Steep, Flat, Inverted & Humped). We can combine and discuss the non parallel yield curve changes. Between the 6 month and 1 year rates we can see some inversion. This means that if the govt. had to borrow for 6 months, it could have to pay a higher yield than what it would pay if it had to borrow for 1 year. The short end of the yield curve is higher as a consequence of RBI’s hawkish stance (or say not dovish). We can also see that the Indian yield curve is flattish, since there is not much difference between the 1 year and ten year rates, as can be seen in the chart above (as range of yield is near 8-8.5%). As per the current data the difference is around 0.22%. Even if the government had to borrow for 30 years, yields would be around the 8.66%, while for 3 months it is at 8.20%. If the spread between short and medium term steepens that shows signs of high expected inflation. If it flattens then probably inflation is expected to ease off. 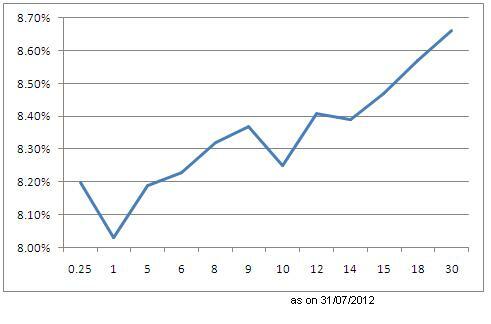 0.25yrs yield comes at 8.20% and 1yr at 8.03% which gives an FRA 3×12 rate of 7.52%. Now this indicates that market is expecting a rate cut of near 50bps in coming 9months.